Mindful learning aimed at lifting the beauty industry to a kinder, more compassionate, and inclusive place. Truth, Beauty, and Goodness offers growth and development for the mind/body/spirit wellness of the beauty professional that can increase engagement, performance and greatly improve quality of life. Whether it's a 1 on 1 coaching session or in a group workshop, we focus on what's right with our clients to increase resilience, navigate challenges and achieve goals. We recognize optimal health and wellbeing of people is at the heart of what’s truly beautiful. Do more for your clients and your business by learning these techniques. 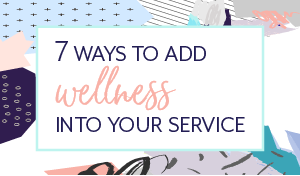 Add wellness to your beauty equation today! 💥 Success! 💥 Now check your email to receive your download.